ComfortStar AC Error Codes and Identification Codes. When codes appear on your Indoor ComfortStar ductless mini-split AC digital display, this tells you a certain option is turned ON or a problem has occured with the AC system. 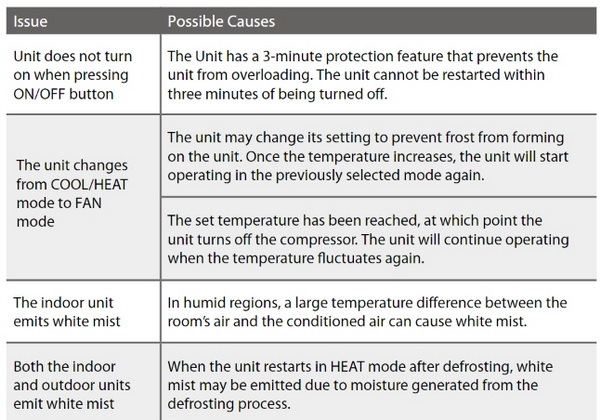 The error code or ident code that displays is letting you know the problem or what is occurring within your AC. Here are all the codes and what they mean. 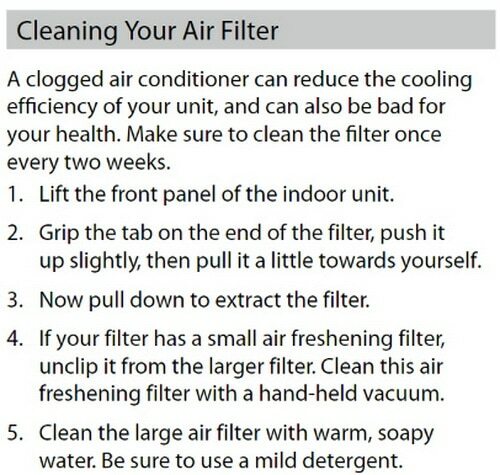 Below is also info for troubleshooting, maintenance, and cleaning the filter on a ComfortStar AC Split System. By knowing the meaning of the identification code or error code (if an error code does appear) you will know what action needs to be taken to fix your AC (if something is not working properly). You can then troubleshoot the issue and repair your air conditioner. Whether it be a certain operation that is taking place within the AC, the AC changes modes, troubleshooting is needed, normal maintenance is required, or parts that require repair. -The unit may stop operation or continue to run safely. -If the indicator lamp continues to flash or error codes appear, wait for about 10 minutes. -The problem may resolve itself. -If not, remove the unit from power and connect it again. -If the problem persists, disconnect the power, contact your nearest customer service center 1-866-524-9898 or see the error code meanings below to troubleshoot the issue yourself. ComfortStar AC Error Code = E0 Indoor unit EEPROM error. 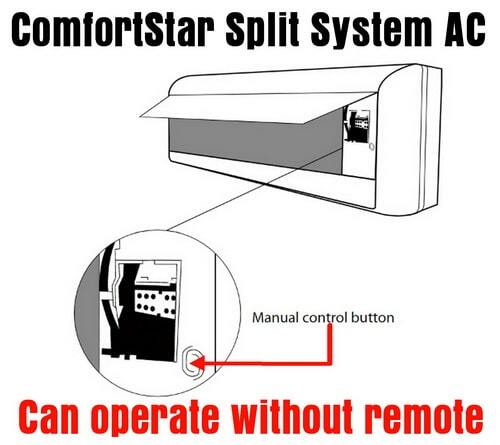 ComfortStar AC Error Code = E1 Communication malfunction between indoor and outdoor units. ComfortStar AC Error Code = E3 Indoor fan speed has been out of control. ComfortStar AC Error Code = E4 Indoor room temperature sensor T1 open circuit or short circuit. ComfortStar AC Error Code = E5 Evaporator coil temperature sensor T2 open circuit or short circuit. 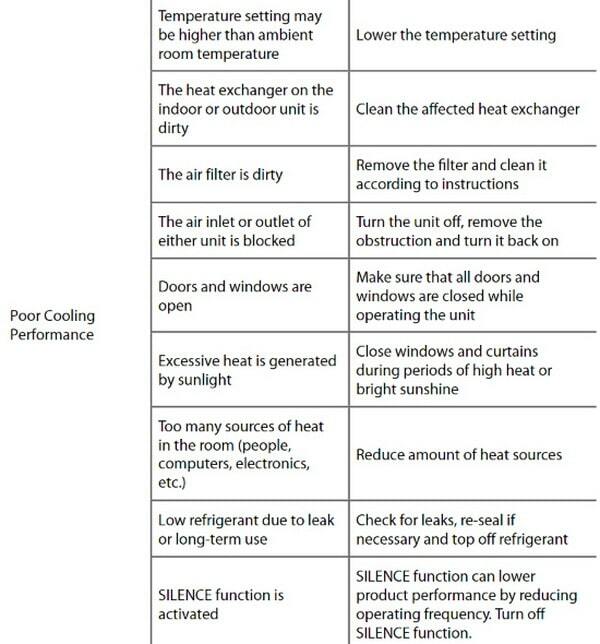 ComfortStar AC Error Code = EC Refrigerant leakage detection. ComfortStar AC Error Code = EE Water-level alarm malfunction. ComfortStar AC Error Code = F1 Open circuit or short circuit of outdoor ambient temperature sensor T4. 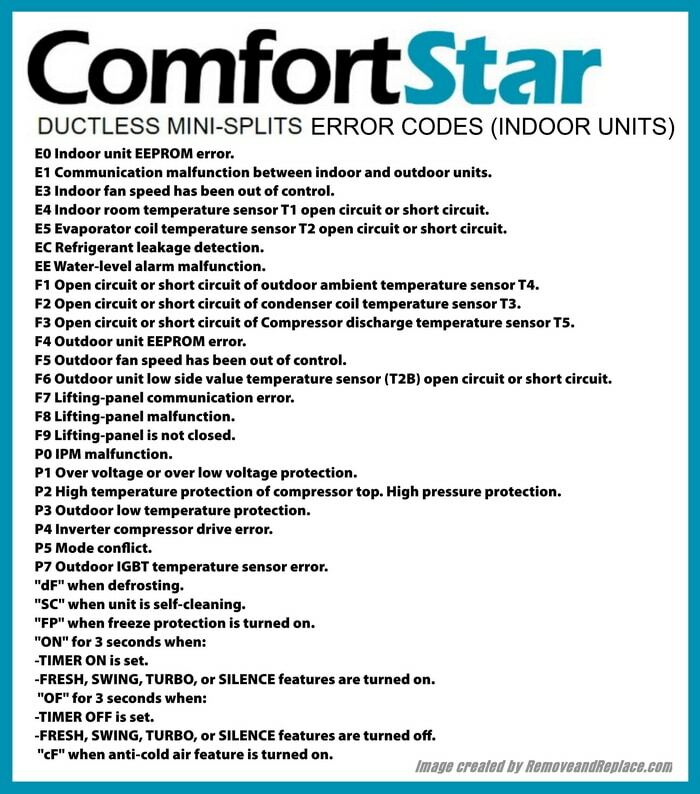 ComfortStar AC Error Code = F2 Open circuit or short circuit of condenser coil temperature sensor T3. ComfortStar AC Error Code = F3 Open circuit or short circuit of Compressor discharge temperature sensor T5. 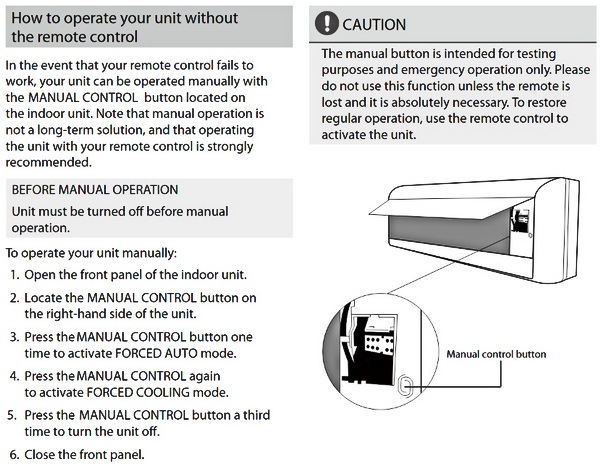 ComfortStar AC Error Code = F4 Outdoor unit EEPROM error. 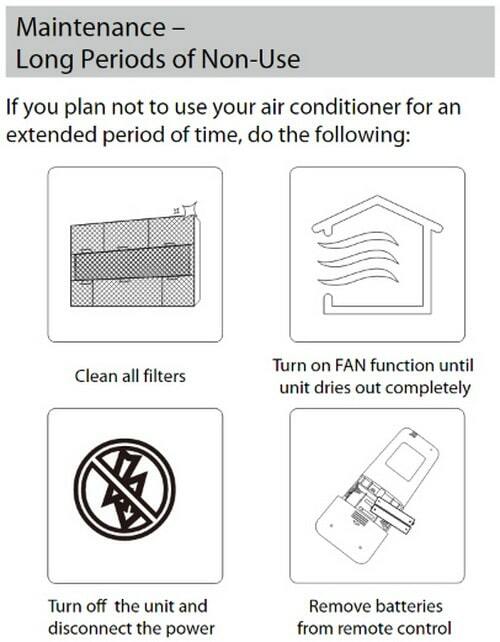 ComfortStar AC Error Code = F5 Outdoor fan speed has been out of control. ComfortStar AC Error Code = F6 Outdoor unit low side value temperature sensor (T2B) open circuit or short circuit. (T2B means indoor unit coil outlet temperature sensor located on the outdoor unit low side value). ComfortStar AC Error Code = F7 Lifting-panel communication error. ComfortStar AC Error Code = F8 Lifting-panel malfunction. ComfortStar AC Error Code = F9 Lifting-panel is not closed. ComfortStar AC Error Code = P0 IPM malfunction. 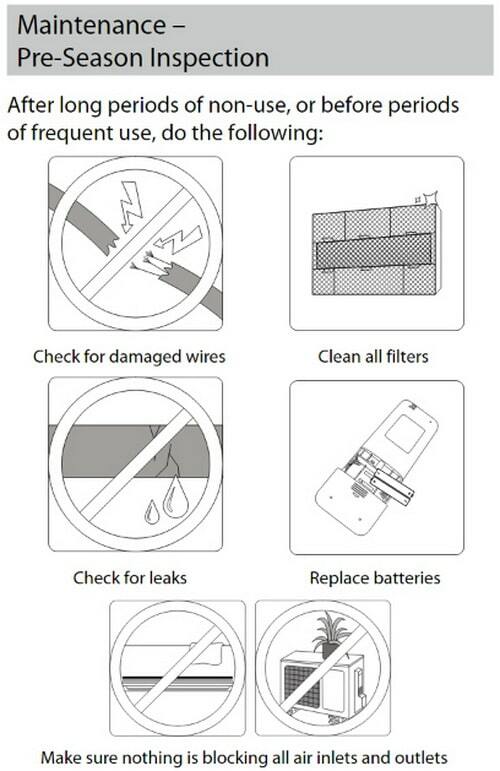 ComfortStar AC Error Code = P1 Over voltage or over low voltage protection. ComfortStar AC Error Code = P2 High temperature protection of compressor top. High pressure protection. Low pressure protection. ComfortStar AC Error Code = P3 Outdoor low temperature protection. 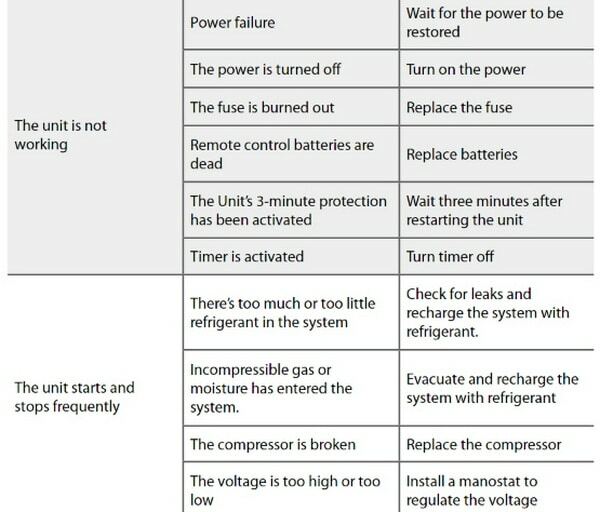 ComfortStar AC Error Code = P4 Inverter compressor drive error. ComfortStar AC Error Code = P5 Mode conflict. ComfortStar AC Error Code = P7 Outdoor IGBT temperature sensor error. ComfortStar AC Error Code = HC Check indoor unit board. ComfortStar AC Code = “dF” when defrosting. ComfortStar AC Code = “SC” when unit is self-cleaning. ComfortStar AC Code = “FP” when freeze protection is turned on. -FRESH, SWING, TURBO, or SILENCE features are turned on. -FRESH, SWING, TURBO, or SILENCE features are turned off. 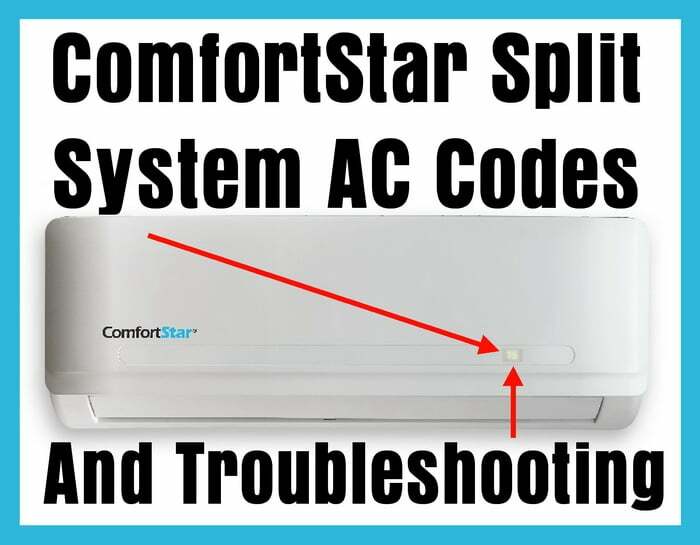 ComfortStar AC Code = “cF” when anti-cold air feature is turned on. 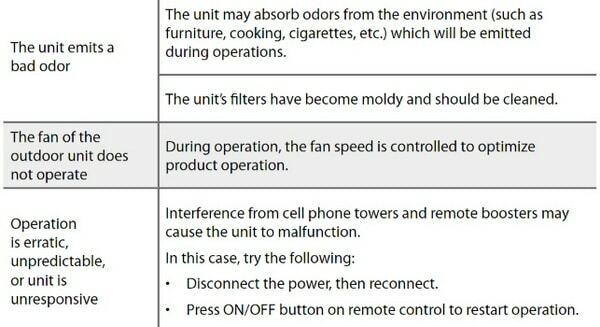 The AC unit will display the room temperature in Fan mode. The AC unit will display your temperature setting in other modes. – Make sure not to block the air inlets or the outlets of the AC. 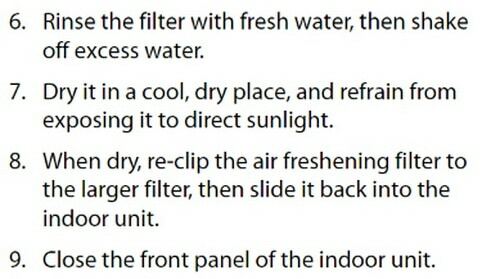 – Regularly check and clean the air filters. – Keep your doors and windows closed. – Limit the energy usage by using the TIMER ON and TIMER OFF function. Indoor Unit Model CPG009CA, CPG012CA, CPG009CD, CPG012CD, CPG018CD, CPG024CD, CPG030CD, CPG036CD. Outdoor Unit Model CPG009CA, CPG012CA, CPG009CD, CPG012CD, CPG018CD, CPG024CD, CPG030CD, CPG036CD. 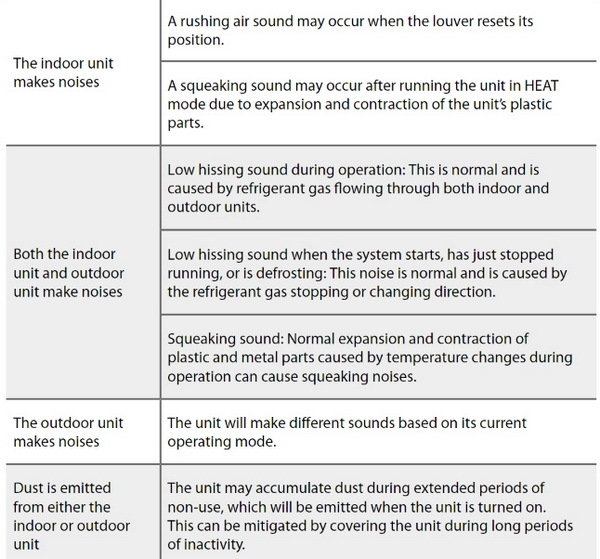 Indoor Unit Model CPP009CA, CPP012CA, CPP009CD, CPP012CD, CPP018CD, CPP024CD. Outdoor Unit Model CPP009CA, CPP012CA, CPP009CD, CPP012CD, CPP018CD, CPP024CD. The above codes are for the ComfortStar Ducted CPA-09, CPA-12, CPA-18, CPA-24. The above codes are for the ComfortStar Floor ceiling FPA-18, FPA-24. The above codes are for the ComfortStar Cassette TPA-09, TPA-12, TPA-18, TPA-24. The above codes are for the ComfortStar Wall Mounted CPP009CD, CPP012CD, CPP018CD, CPP024CD. 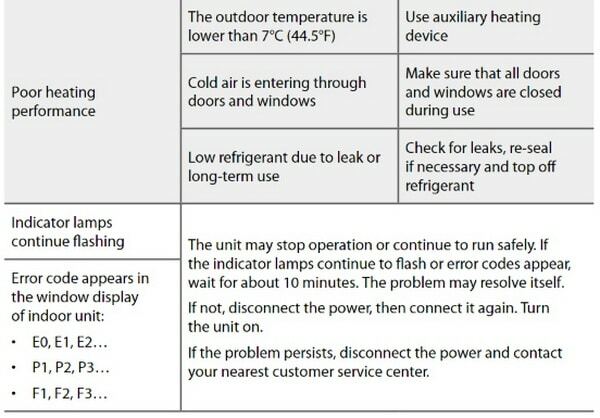 Need help with your ComfortStar AC displaying error codes or troubleshooting an issue? Please leave a comment below and we will be happy to assist. We have a COMFORTSTAR PLUS unit (MODEL: CHH012CD-13) installed new Jan 2007. Until just recently ( June 15, 2018 ) it was working just fine. Lately, the OUTSIDE unit works fine, but the INSIDE unit runs for about 15 minutes and shuts down. We can hear the cold air trying to come thru the INSIDE unit and we can feel COLD air dribbling out of the INSIDE unit, but the blower won’t keep going. Is there any way to fix this? Could it be a clogged drain from the INSIDE unit? Could it be a THERMISTOR problem? How can I go about getting this unit fixed without having to replace the entire mini-split system. Previous post: Microwave Oven Tripping Breaker – What Is Causing This? Next post: Bosch Dishwasher Beeping – How To Turn Off Alarm Sound?